Can I Be a Leader? Even if I Don’t Have the Title? Successful people seem to radiate confidence. It’s obvious that they feel assured about themselves and what they’re doing. But in almost every case, it’s not success that makes people confident—it’s confidence that makes them successful. Here are seven bulletproof strategies you can use to become more confident. Think confidently. Many people limit themselves with what they think. Remember, you can always go as far as your thoughts let you, and what you believe you can achieve. So, what are you thinking? Are they positive thoughts? Are they thoughts of you being successful? If not, it’s time to change your thinking and change your life. When you think confidently you become confident. Communicate confidently. A confident person is assured in their communication. They speak up when something needs to be said and they say what needs to be heard. When you communicate with self-assurance, you gain respect. And that respect, in turn, gives you even more assurance. Decide confidently. When decisions need to be made, a strong confident person jumps in and makes them. They may study the situation, but they don’t waffle over the options. When you’re strong and decisive, you invariably come across as self-assured and self-confident. Act confidently. The quickest way to acquire confidence is to tackle something you fear and learn to do it well. Confident people are not afraid to take on challenges, because they know their self-opinion isn’t based on a single success or failure. What they do does not affect their outlook. They know that they’re always going to do their best in any given situation, so they will act confident even if mistakes happen. The best way to act confident is to feel confident. Believe confidently. No matter how you well you think you carry yourself, if you do not believe in yourself it will show. People determine how to treat others based on perceptions, so it’s important to project belief in yourself. Knowing your worth gives you inner confidence, which leads naturally to confident behavior. Dress confidently: People often make snap judgments based on a person’s appearance. Sometimes that means dressing the part. If you look like you’re ready to get things done, people are more likely to treat you with respect and deference. Self-confidence is the best outfit, so give it your personal spin and own it. Focus confidently. Confidence is all about focus. Confident people focus on how to improve everything they do until they succeed. People who lack confidence, on the other hand, focus on what they don’t know and what they can’t do. They worry about their shortcomings instead of leveraging their strengths. When you worry about failing, you’re more likely to fail. But when you confidently seek out solutions, you’re more likely to succeed. Lead from within: Confidence is within your power. if you take to heart these seven strategies and incorporate them into your life, you’ll soon be the picture of confidence. 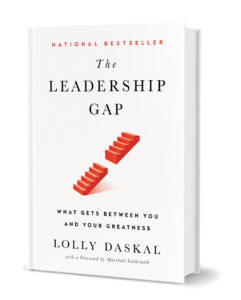 After decades of coaching powerful executives around the world, Lolly Daskal has observed that leaders rise to their positions relying on a specific set of values and traits. But in time, every executive reaches a point when their performance suffers and failure persists. Very few understand why or how to prevent it. The post 7 Guaranteed Ways to Boost Your Confidence appeared first on Lolly Daskal. Almost everyone struggles with self-doubt at some point or another. And almost everyone thinks they’re the only one who does. They focus on the things they don’t know instead of what they do. Everyone needs to stretch out of their comfort zone, but if you spend most of your time working outside your expertise you’re likely to end up doubting yourself. They tell themselves that others have more experience. Even if you aren’t the most experienced, if you have a skill or knowledge they lack, you’re the expert. Allowing yourself to believe that what you know is valuable and useful will give you the assurance you need. They don’t believe they have the right skills. You have to start somewhere—whether it’s your first job or reinventing your career in a new industry. Virtually no one has all the skills required for being a great leader right from the start. Learning the skills you need in your current situation gives you power—and makes you a smart leader. They care too much about what other people think. It’s easy to get stuck on what people tell you about yourself. If you focus too much on what other people think, you’ll never learn to think for yourself—and about yourself—on your own. Stop worrying what other people think and concentrate on doing your best. They fear they’re not good enough. Especially when you’re faced with something new, you may experience a fear that you’re not good enough for the task at hand. This inner voice is your mind trying to protect you, but you don’t need protection. You just need to know you are good as you need to be, and then take a chance. They allow a past mistake to loom over the present. Mistakes—especially those with lasting consequences—often leave people seriously doubting their abilities. Allow those mistakes to become learning lessons for the present and the future without dwelling on them. Sometimes things have to fall apart before they can be put back together. They’re busy competing with everyone else. It’s always tempting to compare yourself with colleagues, but it’s much more productive—and healthier—to take stock of who you are and what you’re good at. Remember that you have strengths other people don’t possess and that the only person you can truly compete with is yourself. As a coach, I define confidence as believing you are able and competence as knowing you are able. When you know you’re able, you can take action regardless of self-doubt. You can’t live your life for other people. You’ve got to do what’s right for you. Lead from within: Even the smartest people need to remember that when they doubt their power, their doubt can be powerful. The post 7 Powerful Reasons Smart People Doubt Themselves appeared first on Lolly Daskal. Self-confidence is an essential part of leadership. A leader with self-confidence thinks positively about the future and is willing to take the risks necessary to achieve their personal and professional goals. A leader who lacks self-confidence, on the other hand, is less likely to feel that they can achieve their goals, with a negative perspective about themselves and what they hope to gain in life—attitudes that are destructive to leadership and success. Address your self-doubt. Everyone has self-doubt, but if you don’t address it, it doesn’t go away. Your inner voice of self-doubt is never helpful and will hold you back. Identify it, work to understand its origins, and resolve to tune it out entirely. Learn to leverage your self-doubt into confidence. My latest book, The Leadership Gap, includes a whole chapter on how to leverage your self-doubt. The simple version is this: when in doubt, concentrate on what you know, what you know how to do and how well you do it, and put all the self-doubt aside. If you focus on your competence and capabilities you’ll find the confidence you need. Eliminate triggers. Avoid negative thinking or spending time around things that can make you feel bad about yourself. These triggers may be people or places or situations—anything that leaves you thinking you’re not good enough. Recognize your talents. Spend some time recognizing and reconnecting with your strongest talents to stay focused on your strengths. Look inward instead of outward to avoid comparing yourself to others and falling into the trap of imposter syndrome (“nobody knows what an unqualified loser I really am”). Give yourself permission to take pride in what you do well and to express yourself in your talents and strengths. Bounce back from your mistakes. Remember that no one is perfect. Even the most confident people have insecurities, and there’s no one alive who hasn’t made a mistake. Don’t let one wrong turn, or even a few of them, make you think you don’t have what it takes to achieve your goals and reach your success. Surround yourself with people who believe in you. Nothing is as powerful as people who think you’re great, who believe you can do the impossible, and who have all the confidence in the world in you. Surround yourself with those people and be intentional about maintaining those connections. Stick with the people who lift your perspective and avoid (or at least tune out) those who make you feel bad or doubt yourself. Take pride in yourself. Many people think that taking pride in yourself negates humility. But you can be proud of yourself without sacrificing humility. Pride feeds the soul; it helps you recognize and appreciate who you are and what you can accomplish. Sometimes it’s the motivation we need when things get tough. Lead from within: Confidence is as important to leadership as oxygen is to breathing. If you’re lacking in confidence, we are lacking in influence. The post This is How Leaders Improve Their Self Confidence appeared first on Lolly Daskal. We all know confidence is a big competent of success–it’s the determinant of achievement, the drive that keeps you going. But we don’t always have as much confidence on hand as we need. Most people will tell you to “fake it till you make it” when it comes to confidence. But I am not a big believer in that belief. I don’t think you have to fake anything, because you already have within you what you need. You just have to discover the qualities that make you feel confident by connecting you with those inner resources, and lead from within. 1. Go out of your way to get out of your comfort zone. Confidence comes from taking risks. When you take a chance and get positive results, it proves you are capable. Wins turn into empowerment. Don’t let the fear of discomfort failure make you frightened to try–be bold and take the risks you need to be successful. 2. Adopt a positive outlook and a noble cause. Spend as much time as you need to find the good in life. Consider what is meaningful; think about what you want to achieve and how you are going to achieve it. Look for things that inspire and motivate you. Most of all, adopt a positive outlook and stay connected to a noble cause. Confidence soars when you embark on a mission with an honorable purpose–and if you look around, you’ll realize that those among us who live purposefully and seek out ways to serve others are the most content. 3. Get up one more time than you have fallen. You demonstrate confidence every time you fall down and have the tenacity to get back up–from knowing how to learn from problems and mistakes, let them go, and move on, whether it happens once or a hundred times. 4. Become as well-informed as you can. School yourself on current events and general information–make a point of filling whatever gaps exist in your knowledge so you can build a broad perspective. Being knowledgeable gives you the confidence to contribute meaningfully to conversations and planning. 5. Don’t let perfectionism stop you from trying. Perfection is the enemy of success. When you have feel you have to be perfect, it’s easy to become locked up with enough fear that you don’t even try. Instead, satisfy yourself by doing your best work and having confidence in its value. 6. Look the part, feel more assured. Make subtle changes to empower yourself through the way you dress, your body language, and even in the way you speak. Taking small steps toward displaying your confidence can help you strengthen it. That doesn’t mean trying to be something you’re not, but showing others your own unique and talented self. 7. Trust your instincts, go with your gut. You know more than you think, so learn to trust the inner voice that says, “You can do this.” When that trust is absent, the resulting void keeps you from achieving all that you’re capable of. is the void that keeps us from the achievements that are possible. Trust yourself and you’ll know how to succeed. 8. Don’t let the past dictate your future. Your level of confidence is set in part by how you’ve dealt with past struggles. Much of the difference between those who are confident and those who are not lies in how they carry their past. Learn from struggle and make it part of you, and then move forward believing that you are credible, smart, and worthy of success. Show the same compassion to yourself as you do to others. If you can stretch yourself to cultivate positivity, tenacity, and trust in yourself, you will find a deep well of confidence to lead you in whatever you choose to undertake. The post 8 Powerful Ways You Can Restore Your Confidence appeared first on Lolly Daskal. We each have within us some inner enemies that can quickly kill off our confidence. They drain our lives of potential and our purpose, and they fill us with deep regret. Left unchecked, they can unfortunately quickly erode our grandest plans and our noblest intentions. See if you recognize any of these 12 confidence killers in your own life. If you do, you need to crush them now. Your future depends on it. 1. Feeling unworthy. Self-confidence comes when you feel worthy of who you are and what you’re accomplishing–when you believe in yourself. When you think or say you’re in any way not good enough, you’re rejecting your own value. Combat these feelings by thinking of the things you appreciate about yourself. 2. Constantly overthinking. One of the worst enemies of confidence, overthinking leads to negativity. It twists things around, makes you worry, and makes everything appear so much worse than it actually is. When you give up overthinking you’ll be amazed to see how many problems it caused. 3. Surrounded by negative people. Some people think being alone makes you lonely, but for me being surrounded by the wrong people–and negative people in particular–is far lonelier. Negative thinkers will never do you any good, so stay far from them. 4. Dramatizing everything. If you’re scripting negativity and trouble in your mind, drama is bound to result. But it doesn’t have to be that way. Whether you believe it or not, you have the power at any given moment to let go of the narrative so far and remind yourself that this is not how the story ends. 5. Telling yourself you’re not smart enough. Nothing hurts more than trying your best and still not feeling smart enough. To regain your confidence, you have to literally tell yourself, “I am smart enough to succeed. I already know a lot, and what I don’t know I will learn.” Each of us is smart in what we know–we just have to acknowledge it. 6. Thinking that good things only happen to other people. Why do we always think the grass is greener on the other side? The truth is, if you were to get the baggage of others you would likely be glad to give it back. You never know what other people are carrying, being grateful for the good things you do have and be patient for the rest. Maybe it’s your turn to be the good thing that happens to someone else right now. 7. Living in the past. What’s done is done, as the old saying goes. We all have decisions we might undo if we had a choice, good times we took for granted, events we wish we could have avoided. You can’t change the past, but find strength and hope in the fact that you can always change today. 8. Counting your failures. We all fail sometimes–some more than others. It doesn’t make you unworthy or less intelligent. Remember, the only people who never fail are the ones who play it far too safe. 9. Measuring your mistakes. Regaining confidence after a mistake can be tough, but try to redefine the terms. If you want your confidence back, learn to treat your mistakes valuable lessons that you have learned and moved on from. 10. Sabotaging yourself. There are few things more self-defeating than negative talk or putting yourself down. Negative self-talk can be so pervasive that you can’t even hear it any more. Shut down your inner voice of fear and negativity and unworthiness. 11. Comparing yourself to others. You will never believe in yourself as long as you’re comparing yourself to someone else. Being kind and true to who you are–to your unique thoughts, ideas, actions, and beliefs–is as important as being kind and honest to others. 12. Being ungrateful. No matter how bad you have it, someone will be worse off; no matter how good you have it, someone will be doing better. Gratitude allows you to focus on what you do have instead of what you don’t. It gives you the confidence to appreciate what’s around you and the poise to pay attention to details you might overlook. Any time you need a boost, take an inventory of all the great things you have. In short: Be positive, be true and forgiving with yourself, be grateful. That’s the recipe for building self-confidence. The post 12 Confidence Killers You Need to Stop Doing Right Now appeared first on Lolly Daskal.